Reviews for Nicholson Landscaping Ltd. Thank you Drew, we appreciate your review. We stand by our workmanship here at Nicholson Landscaping and look forward to helping you out again in the future. Design to implementation - removal of a completely destroyed front yard. Couldn't be happier with the work to date. Install occurred in September. Gave four stars due only to the fact that the plants have not yet bloomed. Once they do bloom, this would be a five star rating. Thank you Ryan for the review. The Grass to Garden look has been highly popular for low maintenance and effective to help against the chafer beetle, raccoons and crows. I'm glad you're satisfied with the work and I'm sure the plants will flourish in the Spring. We commissioned Nicholson Landscaping Ltd to re-build a sixty year old messy front and back yard. Since the property is in a steep incline, considerable work needed to be done. It involved stone retainers, steps, drainage, shaping the yard and planting trees. All in all, they have done a fantastic job. Completed on schedule, and at a good price. All debris was removed and the yard left behind was all cleaned up. Mostly, I must say, the crew of five men were fantastic. Professional, engaging and friendly willing to explain the progress of the work. Thank you so much for the review. It was a large and steep area but it turned out looking great. 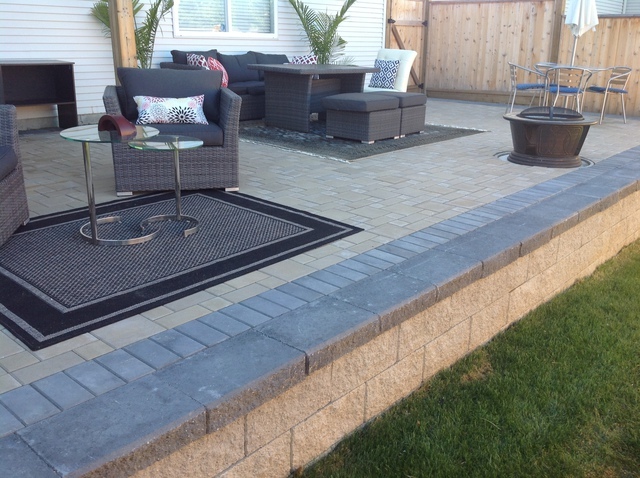 Nicholson Landscaping likes taking on challenging projects, it continually proves we are a quality hardscaping company. We appreciate your business and hope to work with you again in the future. since. I would strongly recommend them to anyone. Thank you very much for the 10 stars, your yard turned out great. We are glad you are able to use it more now. We love Coquitlam for this reason, there are a lot of old rotting railway and landscape tie retaining walls that need replacing. Give Nicholson Landscaping a call to help turn your yard back into a beautiful space to spend with your family. We got a patio built for our hot tub and retaining wall for our backyard planters, we were very happy with all the work that was done. Thank you neilandrandi for the review. Small or large jobs we are able to transform your outdoor living space, give us a ring back if you want to do anymore work. We can create ambiance and install outdoor lighting, gazebo's, water features and kitchens. Look forward to working with you again. I can only describe my experience with Nicholson Landscape as “superior”. Our job was small (a retaining wall along 15 feet of our sidewalk was collapsing) but complicated. I contacted a couple of landscaping companies but Nicholson was the only one that responded. Ryan came to our place the next day to give me a quote. It was a day and a half job requiring two workers and lots of equipment. They were able to start the work the following Saturday. Their staff worked hard, were pleasant and knowledgeable. Ryan came by once to ensure that the work was progressing as it should. I thought the quoted price was fair. The final results were excellent and exactly what I wanted. I would highly recommend this company. Thank you Hazel for the great review, it was great to work with you as well. We really pride ourselves on a job done well and love to see that recognized. More about Nicholson Landscaping Ltd.
Nicholson Landscaping has been shaping the Tri-Cities area for over 10 years. Started in the 2008 by Ryan Nicholson, a Journeyman Landscape Professional from the School of Landscape Construction, Maintenance and Sport Field Installations in Hamburg Germany, with an apprenticeship in landscaping & horticulture, Ryan has a wealth of knowledge and experience in bringing out the best in plants foliage. He has also taken many certification courses in BC, including chemical application, proper pruning techniques and is a ICPI certified paving stone and aquapave installer. Plus a certified Basalite Retaining Wall installer. Also Ryan earned his Certified Landscape Technician certificate in Hardscaping from the BCLNA. Nicholson Landscaping is a small company and currently employs 9 people on 3 crews. We are lucky to say this means we have over 70 years of landscape experience in the crews. From 3 guys with over 20 years experience, plus young energetic people with a passion for this trade and looking to learn.